When your download has finished, see How to install LuneOS on the Nexus 7 (Wi-Fi, 2012 version). 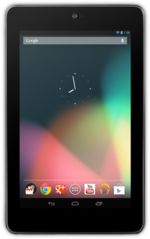 See How to Build LuneOS for the Nexus 7 (Wi-Fi, 2012 version) . Hold Volume Up, Volume Down, & the Power button. Continue to hold all three until the screen flashes, then release all buttons. You may find assistance with the Nexus 7 (Wi-Fi, 2012 version) on our IRC Channel on the Freenode Network. #webos-ports. Files are provided for archival purposes and are not supported by LuneOS. This wiki has a "master" device template for adjusting settings pertaining specifically to the Nexus 7 (Wi-Fi, 2012 version) (learn more). To change these master settings, edit the wiki device template at Template:device_Grouper. This page was last edited on 5 November 2013, at 06:40.